Moisture affects a huge range of diverse materials in formulation research areas. For example, drug formulation performance can be critically affected by humidity changes leading to phase changes, hydration, crystallization and deliquescence of pharmaceutical powders.Other areas affected by humidity include solubility, hydrate/solvate formation, packaging, powder flow, tablet testing, aerosol and inhalers. 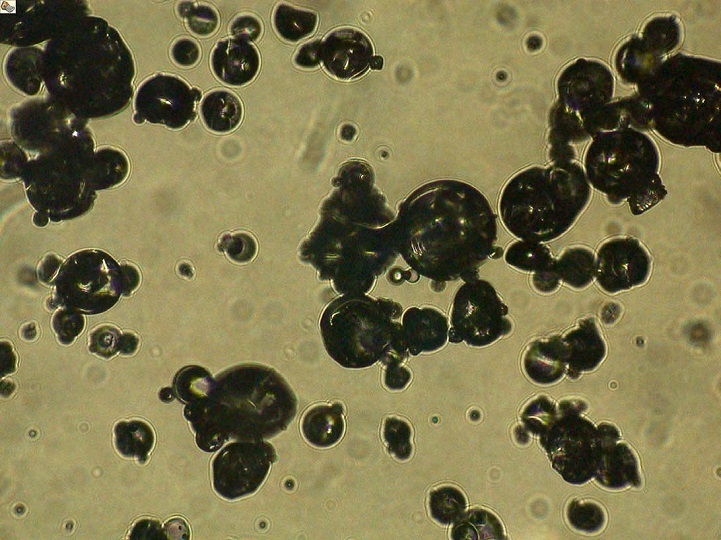 One of the many tools used to characterise the effects of moisture in formulation is microscopy , ranging from common microscopy using dark-field, bright field or cross-polarisation through to Raman, FTIR microscopy and more esoteric imaging techniques such as Atomic Force Microscopy , 3D X-Ray Tomography or even photo-acoustic microscopy (PAM). 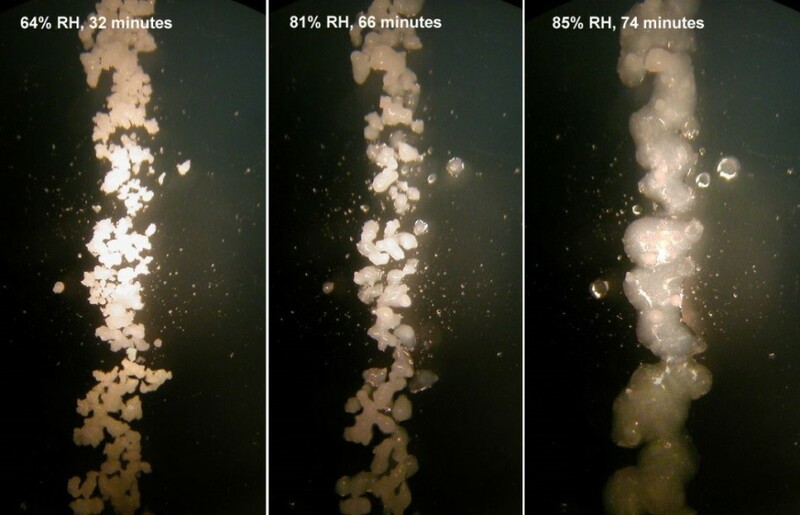 In this article we present some case studies to highlight how different kinds of microscopy can be effectively used to study the effects of moisture humidity on real life formulation situations. 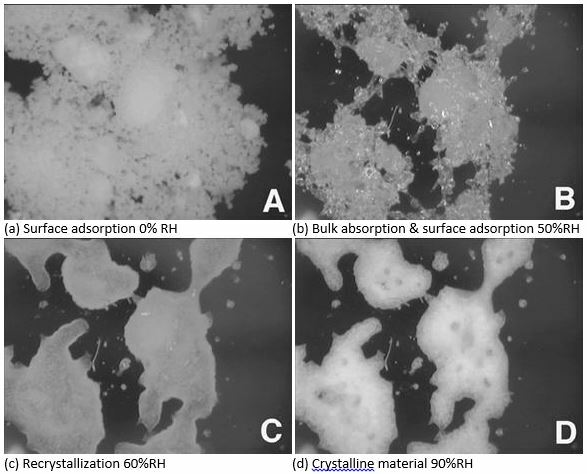 Studies of crystallisation of amorphous samples under humidification include hydration of stable and unstable hydrates, deliquescence and liquefaction of hygroscopic samples, co-crystallisation and solvate desorption at high humidities. Polarized light microscopy and birefringence can be used effectively to study crystal morphological growth. Polymorphism can be studied by Raman, FTIR, and light microscopy (ref 1). 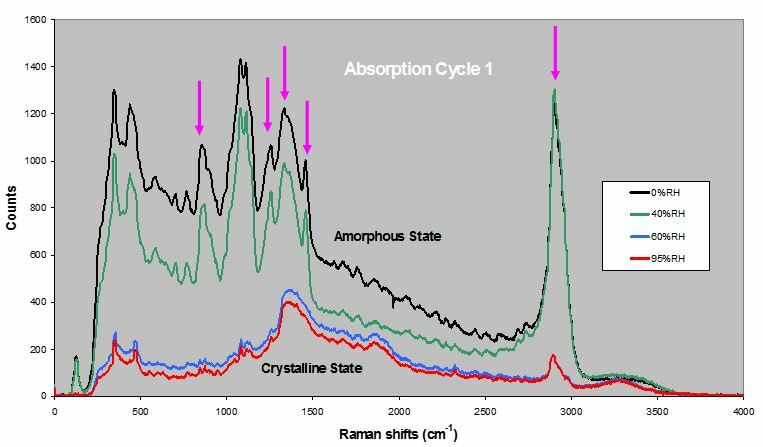 Light microscopy of amorphous lactose crystallisation with humidification can be combined with Raman data to show the change from amorphous to crystal state with increasing RH. The behaviour and stability of potential drug candidates on exposure to water are critical in deciding which candidates are taken forward in drug development studies. Gravimetric techniques such as Dynamic Vapor Sorption (DVS) can be combined with FT-IR and a humidity cell to gain deeper understanding of the molecular changes occurring. This helps in the development of drug candidates with optimal stability / performance. Naloxone HCL (an anti-narcotic substance) was used as a model system to study the effects of moisture sorption on active drugs.The water sorption and desorption isotherms showed jumps in the water uptake at 10% and 60% RH corresponding to formation of the mono and dihydrate. 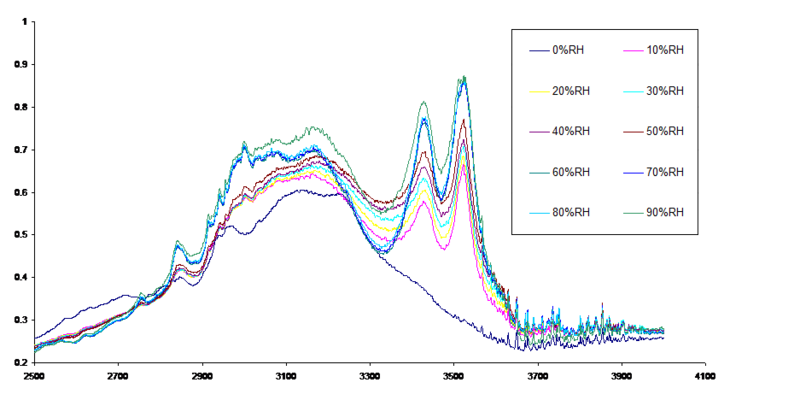 IR Intensity versus RH plots of these two peaks corresponding to the asymmetric water stretching frequencies at 3518 cm-1 and 3421 cm-1 showed a jump in intensity at 10% and 60% RH. These two jumps correspond to formation of the mono- and dihydrate forms and agree well with the gravimetric data. Effects of humidity on flowability of lactose due to changing amorphous and crystalline content were studied using Raman and light microscopy. Effects of humidity on dry milk powders were measured using light microscopy (ref 2). Using Raman microscopy combined with a humidity cell it is possible to image skin sections of skin/drug preparations to determine speed of adsorption of the drug, evaluate wound healing therapeutics and study skin ageing related to hydration. Adhesion between drugs and their carriers with amorphisation due to humidity have been studied using atomic force microscopy. These are just a few areas where microscopy can be usefully used to study the effects of changing humidity on real life formulation samples. To help meet the many needs of scientists and technicians in these areas, Surface Measurement Systems have developed an environmental microscopy cell GenRH-Mcell (ref 3) to enable precise critical humidity microscopy studies in situ. Additionally, humidity critical studies can be undertaken via a variety of instrumentation by providing humidity generation as an add-on to other techniques such as XRD, 3D X-Ray Tomography, DMA, TGA, DSC, rheology, contact angle, aerosol EDB, optical tweezers, traps, particle sizing, and QCM. Conditioning regimes such as mechanical and texture testing, ball-milling, powder compaction, spray drying, freeze drying, and powder flow can also be emoployed. If you have any humidity generation needs or questions in such areas please feel welcome to contact the author or join our Open LinkedIn discussion group on Humidity generation as an add-on. About the author: Jan Gorgol (jgorgol@surfacemeasurementsystems.com) studied Physics at Bristol University followed by a Masters at Brunel University while working with XPS & SEM at the Experimental Techniques Centre. After working extensively in surface science instrumentation globally he now is Product Manager for the GenRH series of humidity generation products at Surface Measurement Systems. 1. Dependence of cocrystal formation and thermodynamic stability on moisture sorption by amorphous polymer. David Good, Crystal Miranda and Naír Rodríguez-Hornedo: CrystEngComm, 2011,13, 1181-1189. 2. Surface Measurement Systems, Application Note 503 – Investigating Dried Milk Powders Using Optical Microscopy at Different Humidity Conditions. 3. Surface Measurement Systems, Application Note 501 – Environmental Microscopy using the GenRH-A Humidity Generator and Mcell Accessory.